With Hubby out of town all week, I decided to paint our kitchen walls. But let me just say (in case I've implied otherwise), that I absolutely dread painting. I think by far the hardest part for me is just getting started. For example, I put on my calender "Paint Kitchen Tuesday." Wednesday came and about 5pm, I called my Mom and said, "ugh, I have to paint the kitchen today...at some point." It was 6pm before I started and almost midnight before I finished. I painted the walls Simply White (eggshell finish), which is the color we used on the cabinets, shelves and trim (in semi-gloss). With a fresh clean slate, I then experimented with creating a not so kitcheny kitchen! Jennifer over at The Newlywed Diaries inspired me with this post! 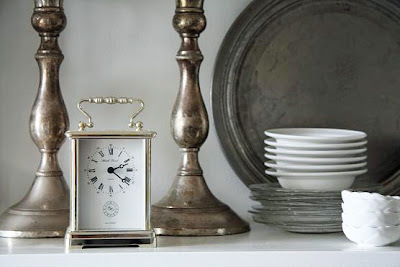 As I began gathering up some not-so-kitcheny items, I started to gravitate towards all things white, silver and wood. I added a clock, some candlesticks, an alabaster bud vase that I put toothpicks in (to add some wood) and my sweet little owl figurine. I tried to break away from my previous tendency to create too much symmetry. I still tried to balance things out, but in a more irregular way. I like how the light reflects on the silver things. I also really love my owl figurine. No, I can't tell that you didn't spend much time arranging those beautiful shelves!! You have such lovely things and you do a wonderful job of arranging them all. Love the picture of the two of you as well! WOW, I love those open shelves. You did a fabulous job of styling them. All your personal collectables make a difference, as does the silver. Really lovel. I really love that you painted everything white! It is just so calming... We just put color all over our walls (the previous owners had horrid taste) and now I'm slightly sad - I wish I would have painted it all white!!! A lovely look! 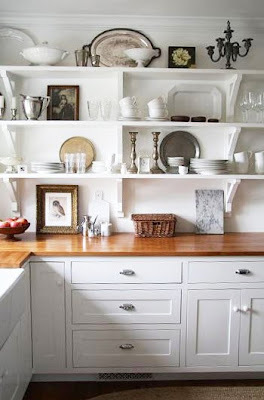 I am wishing that I have some open shelving in my kitchen! I love the combination and the paint. What a great idea this is. Truly gorgeous. Trina - It looks amazing! The shelving and your collections look so pretty in the clear light from the window. I'm totally with you on getting motivated to paint. It's hard, but your results were more than worth the effort - just lovely. I dread painting, too. Your non-kitcheny kitchen looks beautiful! Metal is such a perfect contrast for clean, pretty, white. I'd say you definitely accomplished your not so kitcheny kitchen goal! The shelves look fresh and warm ... really nice. You did a wonderful job with the shelves! LOVE IT! It looks so fresh! Except now I feel like MY kitchen needs some sprucing up. LOL! Fortunately I was planning on decorating for Valentines day in the kitchen anyway. I will be sure to post pictures of it on my blog next week, so be sure to check it out. I really like the way the white, silver and wood looks. I also like the way you make it look 'not kitcheny'. Your owls are a hoot (get it? Hoot!) and those pewter candle holders are stunning. That looks very pretty and fresh. I like silver a lot. Let me the first to say, I love it! I think you did a beautiful job. I like symmerty too, sometimes feel great need for it and often it is necessary for the best outcome. And, sometimes the best solution is to let it evolve in an organic and natural way. As I mentioned in a previous comment, I love the fact you are so willing to experiment and change it up. Each time to great effect! What a fabulous blog you have. 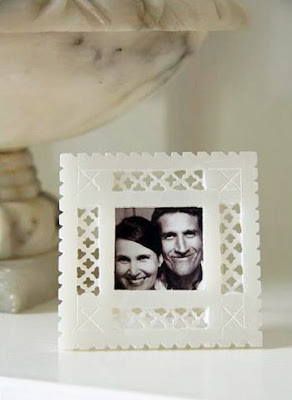 Love your taste in decorating and the photographs are beautiful! Looks beautiful! I am not much of a painter myself-actually my husband doesn't let me paint-I'm too messy(he is right)! So I happily pick out the paint color and then stay out of his way! You did a very nice job of painting I might add! Trina, it looks so fresh and gorgeous - I love everything - you have so many beautiful things! Sorry have not been around the blogs much - swamped at work and missing you all terribly (adn missing writing more). But it is always a treat to come and take a quick glance at your posts, even if I have a minute. I think you are the only person I visit some days...! P.S. Love your silver things! Looks Great! I love your open shelving where did you find them or did you have them made? I hope to have some in our next home. Wow!! I love it! Your kitchen looks amazing as does your whole house! I can't wait to browse around & see everything! I love it Trina! I love the "kitchen as living space" trend, and it's perfect how a few well-balanced themes---white, silver, wood---can make a space both gorgeous and grounded. love it! Love the silver, white, and wood look. Don't you find you notice your things more when you move them around - I love doing it, just for that reason. Oh . . THANK YOU for not having a granite countertops/stainless steel kitchen:)! Love the simplicity and freshness - and where dear girl did you ever find those blue swallow plates? OK, so I don't need another plate (of ANY kind) but I fell in love with yours! Beautiful. Very serene and less kitcheny. But I did so love your red transferware! Adore your trinity: white, wood, silver. Timeless, classic. I love it! 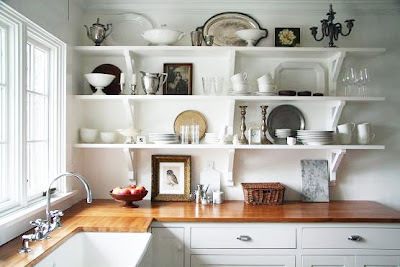 I wish we had open shelving in our kitchen... someday! I think it is just wonderfully done. Does it sound strange to say that it makes my eyes happy? It's just a peaceful and lovely look. Great job, the results look fantastic! I know how you feel about painting, i've painted several houses now and i'm so over it!!! I have four rooms left of our current house to paint and i'm taking so long to get around to them, the rest of the house will need to be redone at the same time! Trina, this is so pretty. Putting it all together was your reward for painting and you did a beautiful job! Love the frame with the two of you, nice touch. I love the mix of the white, silver, and wood. Looks fabulous. Very simple and yet elegant. Nice affect. i just found your lovely blog, i can't wait to look around. 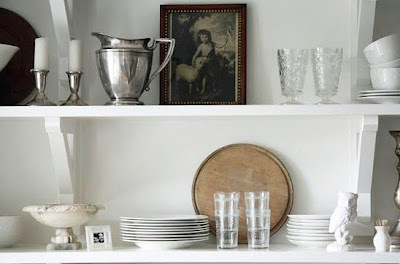 love your shelves in the kitchen! I love the contrast between the white and silver. Lovely job. I enjoy your blog so much. 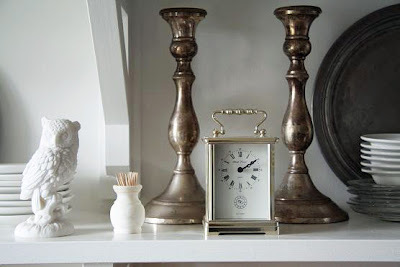 I love decorating with silver objects. Your kitchen looks fantastic. Those shelves are really perfect for your displays. Loving your counters- I just posted about how much I love wood counters and someone told me I had to see your beautiful kitchen. 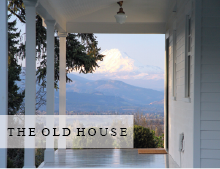 Your house is to die for! Love everything. Just beautifully done. Simply White is the best. P.S. My husband thinks it's quite hilarious that I am so smitten with your blog. Tina it's beautiful!!! (like everything else you do of course) Just love this look though. Also can't get over your flower photos- they're amazing and have me itching for spring too! Looks great Trina. I just love your owls!! I love it! LOVE IT! I'm trying to get motivated to finish my kitchen. I've painted the cabinets gray (MAJOR PAIN!) and now need to do the walls and finish the trim. You can imagine how great it looks in the mean time :) Gray, white and black are my colors on inspiration, too! I just found you, so I don't know quite what the "before" looked like (if it was ever posted), but I love the "after." The white with the open shelves instead of cabinents, the non-kitcheny things included ... yes please! I have saved this pic for when I really have a kitchen. Just beautiful! I'm glad I found this because I noticed that you mix both your silver and your gold finished pieces together. 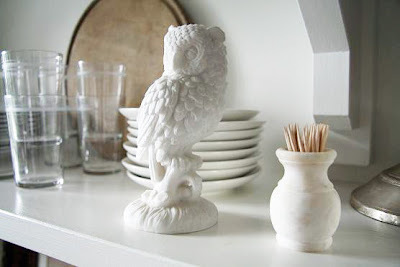 I will be going "white" here at our home and I've had it in my head that I need to choose one finish to use throughout the house as far as accent pieces go. Which one are you drawn to the most? And which do you feel you use the most? I'm loving how antiqued gold leaf pieces look with my red cabinets, but if I go "white" with the walls, beadboard, etc..I wasn't sure if I needed to use silver instead. I've driven myself bonkers over it, lol, even wondering if I need to silver leaf my gold pieces. Ack! Thank you, Trina. All of your pieces and finishes look beautiful together. You've inspired me to use what I love and not be concerned about everything being "matchy". Thank you! Simply White by Benjamin Moore!